Humans have always found reason to celebrate spring. As we welcome the sun back from its hiatus, life sprouts from the rotted remains of autumn, and the world is reborn. Fertility symbols like the Easter egg were common in many such vernal celebrations, like the pagan holiday Ostara, named after the fertility Goddess ostre, which some believe is the root of the word Easter. In Persia, eggs have been painted for thousands of years as part of the spring celebration of Nowruz. Vernal egg symbolism is all the more poignant for small-flock chicken farmers, because spring is when one's hens start laying lots of eggs again after a winter break (big producers, on the other hand, use lights and heat to skip winter). Not coincidentally, this is also the time of year when newly hatched chicks could stand a decent chance of survival, thanks to the warming days. 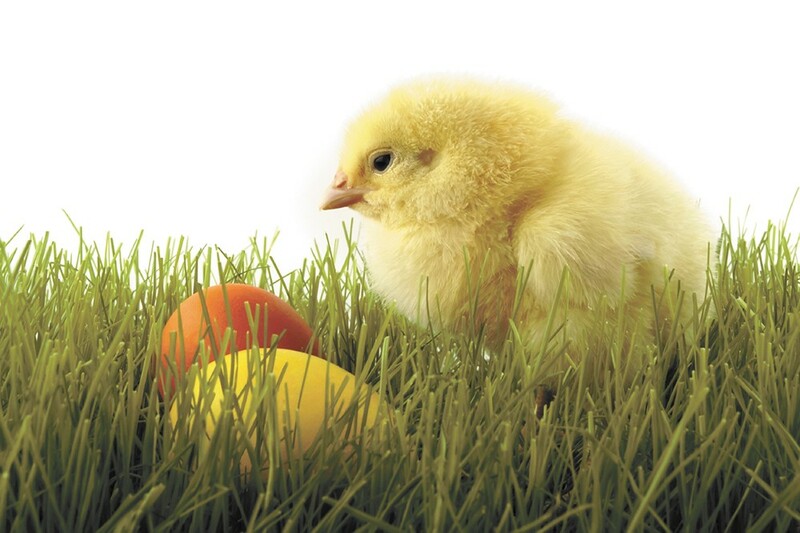 Consequently, spring is when egg hatcheries will begin shipping their day-old chicks. My first flock arrived 10 years ago, just after midnight on Easter Sunday. The post office, of course, is closed at that time, but I got the call to come get them, as happens when live animals are shipped. I've been rocking a flock ever since. Those who raise backyard chickens will inevitably go through an obsessive phase, as the fledgling flockster (this word comes from Harvey Ussery's book The Small-Scale Poultry Flock) ceaselessly dotes on his or her birds, inundating friends with stories, photos and birthday party invitations. The eggs themselves are what drag many flocksters into the game; reverence for the egg increases their love for the mother. For others, egg appreciation starts with a love for the hens, which deepens feeling for their eggs. Flocksters and celebrants of Easter alike use eggs in their respective rituals. And lately, with the widespread availability of hens that lay eggs of various hues, members of both contingents find themselves among prettily colored eggs. My little flock includes a blue-egg-laying Araucana, a blue-greenish-egg-laying Ameraucana, and two black Australorps that lay light and dark reddish-brown eggs. Proper care of my ladies this year included two bags of stale marshmallows that I found in the cupboard. After dumping them in the chicken yard, I was surprised to see the hens completely ignore the marshmallows. Then I had to deal with my kid trying to climb into the chicken yard and eat them. A few days later, one of the hens realized that if you peck hard enough on the dried outer skin of those white things, there is soft sweetness inside. At that point the marshmallows quickly vanished from the chicken yard, and the next day I found four eggs: red, white, blue and green. Though I won't make a habit of feeding marshmallows to my hens, I'm not above pampering them. While buying some chicken feed the other day at the feed store, I picked up two healthy snacks for the girls. The first was a gallon-sized pail of dried bugs. Chicken Grub Insect Medley, to be specific. "Ingredients: Dried mealworms, dried silkworm pupae, dried crickets, dried shrimp, dried earthworms, NOT FOR HUMAN CONSUMPTION." The ingredients seem to confirm what I'd long suspected, that shrimp are basically saltwater bugs ("insects and crustaceans," notes the label). As you hold the tub of creepy-crawlies with the lid off, every vibration of your hand will make them all appear to squirm around. The sight made the ladies in my coop as happy as it made me squeamish. The other treat I got for the ladies out back is a mix called poultry conditioner. Marketed as a supplement for competition and show chickens, it's formulated with a bunch of nutrients and digestive aids to help the birds extract as many vitamins, minerals, pigments, proteins and other materials from their food as possible. I figured that these goodies, in addition to making the girls look pretty, would also make them healthier. And a healthy chicken can put more into her eggs than a malnourished one. Since I started giving the girls poultry conditioner, I honestly haven't noticed if their feathers have gotten prettier, but the eggs have. The color of their shells is richer, and they seem to glow even brighter in the nesting box when I open the coop door. As we mentioned a few weeks ago in our news section, the city of Spokane recently passed an ordinance that, among other things, clarifies the rules for backyard chickens in residential areas. The ordinance, to go into effect by the beginning of next month, allows for hens (roosters aren't allowed) in an enclosed space. The number of hens is determined by the size of the lot.